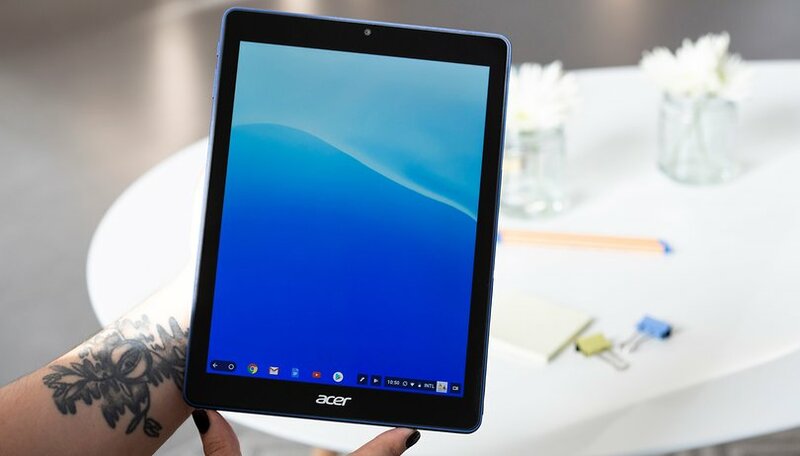 The world of Android tablets has been kind of stagnant as of late, and Acer aims to shake things up with a world first: a tablet that runs ChromeOS. Originally pitched as an educational tool that could be easily managed by school IT departments, the keyboard-free Chromebook is now available for anyone to purchase, but does it make sense? Let's find out the pros and cons of this pioneering tablet. Acer announced the Chromebook Tab 10 back in March as a device exclusively for educational institutions. But now the tablet is available from several retailers as a consumer purchase for around $330. Yes, priced exactly the same as the iPad, it's rival in the educational sphere. That's a lot to measure up to at that price point. The Acer Chromebook Tab 10 is obviously no luxury showpiece but still strikes a good balance between style and practicality . It's reasonably lightweight and elegant in an attractive cobalt blue color but also feels reassuringly sturdy thanks to the rippled backside. It's clearly designed to take a few knocks or fumbles at the hands of awkward high-schoolers. The front is clean with an unobtrusive Acer logo on the bottom and a discreet camera up top. The bezels aren't exactly slim but are quite reasonable for a tablet where you need some extra space around the display to grip. The Acer Chromebook Tab 10 weighs 1.21 pounds (550g) and measures 6.78 x 9.38 x 0.39 inches. This tablet is well-equipped with ports. The top of the tablet features an audio jack, a microphone and three speaker panels. On the left side, we find the power button, a battery indicator light, the volume rocker and a microSD card slot near the top and a dock for the stylus on the bottom left corner. Along the bottom, we've got three more speaker panels and a USB Type-C port for charging and wired connections. In daily use, I found myself appreciating the secure feeling of the grooved back and I liked the metallic blue color. It's one of the more comfortable tablets I've gripped and it doesn't slip or wobble on surfaces. Acer's made a practical tool that's meant to be carried around and put to work every day. The Chromebook Tab 10 has a pleasing a 9.7-inch, 2048 x 1536 IPS LCD display with a pixel density of 264ppi. I'll admit that in daily use, it does look good at all viewing angles , and typical tasks such as email and web browsing all appear clear and easy on the eyes. YouTube, Netflix and the like are perfectly enjoyable in rich color detail, even if brightness is somewhat lacking. Display settings are also limited compared to Android. All you can do is change the size of screen items or activate/schedule the night light and its color temperature. Here's an advantage Acer's odd Chromebook Tab can boast over the iPad. The Wacom stylus sits discreetly in the lower left corner and is easily extracted. Thanks to EMR technology, there's no extra battery or Bluetooth connection to worry about. When you take it out, the tablet prompts you with several options: take a screenshot, create a note, or even to use the stylus as a laser pointer or magnifying glass. Naturally, you can use this to take advantage of all the drawing/note taking apps on the Google Play Store. It's pressure sensitive, so you can press harder or softer to achieve thicker strokes while drawing. All in all a handy stylus, if not great for detailed artwork. The fact that this tablet runs ChromeOS rather than Android is both the main selling point and its most frustrating drawback . ChromeOS may be great for school IT administrators, since they can manage the Acer Chromebook Tab 10 as easily as any of the other Chromeboxes and Chromebooks on campus. Aside from remote management with an Education License, it's a great solution for a multi-user device, as each user can have their own account, the OS is auto-updated and secured regularly and Drive backup will keep everyone's work safe. All great for the original educational market, but as a personal computing solution? Not so much. In attempting to use this Chromebook Tab for writing work, I often found myself screaming internally for Android. ChromeOS isn't optimized for touch input and it was often unresponsive, with my main pain point being that the keyboard was difficult to bring up quickly if I needed to write and edit a document. Something that should be pretty basic for student life, right? The web browsing experience is basically the same as on a desktop, which can be great, especially if you have a Bluetooth keyboard. Then you can more or less divide your use into computing with Chrome and using the touchscreen for Android apps and games. But browsing like this on a tablet isn't ideal. Everything is fullscreen all the time, there's no option to shrink a window. There's no home button, so you can only get to your home screen by exciting the app that you're currently using. No swipe or multi-swipe gesture control. If Acer had bundled in a keyboard dock, this wouldn't be such a big deal but as it happens, this just serves to draw attention to the jagged stitching on this desktop/mobile Frankenstein's monster. An interesting tidbit. You can run Linux apps on the Chromebook Tab 10, if that's your jam. Turn in the option in the settings and you can bring up the Terminal and install Linux apps such as LibreOffice or GIMP. The Linux apps run in a virtual machine and probably won't interest many students or casual users, but its an option for developers power users. The main advantage I can see in ChromeOS over Android for your tablet is the 5 years of updates and support from Google that you get, since manufacturers such as Samsung are notorious for dragging their feet when it comes to delivering the latest Android version. This is a good point for educational institutions but not enough to convince me if I would consider this for personal use. This tablet is hardly a powerhouse by anyone's standards. A 2GHz Rockchip processor is backed up by 4GB RAM and 32GB eMMC storage. What this means in daily use is that the Chromebook Tab 10 is a basically decent computer for single-app tasks, but once multi-tasking is introduced into the equation, expect stutters and slowdowns . When it comes to benchmarking the Chromebook Tab, Geekbench incorrectly identified the OS as Android Nougat, so the numbers may be a little off. But my experience in trying out slightly demanding tasks and games confirms that this device isn't going to dazzle you, performance-wise. For example, I tried to use the tablet as my main tool for running a tabletop game, which means running a couple of browser tabs, an app for rolling virtual dice, a couple of large PDFs and a Google Doc for taking notes. Even opening and closing apps was sluggish, switching between them was frustrating and loading was slow. This isn't a gamer's tablet either. It can just about run PUBG Mobile on the lowest graphics settings which, unless you're nostalgic for the jagged-looking action games of the '90s, isn't particularly pleasant. On top of that, I suffered crashes more than once during gaming sessions that forced a restart. Even simpler 2D games can have issues, but this is more of a software issue than a performance once. The taskbar often stubbornly remains on screen to cover game buttons and notifications, and pinch-to-zoom usually doesn't work. So while you've got full Play Store access to unwind after school, don't expect all games to run reliably. This may be in order to prevent the original audience of schoolkids from making a ruckus in class, but the Acer Chromebook Tab 10 doesn't make a whole lot of noise . It's just about fine for close range video watching or listening to podcasts or online radio but it misses a lot of nuances when it comes to music. The good old audio jack is present here, as is Bluetooth, so if you care at all about good sound on this tablet you'll be using them to connect external speakers or headphones. Although you wouldn't expect a budget tablet to come with cameras to rival top smartphones, the 5MP rear camera and 2MP front camera both manage to be underwhelming, and another reminder that this device isn't targeted at the consumer market . No LED flash, no autofocus, and just forget about low-light photography. You won't be reaching for the Chromebook Tab 10 for a beautiful picture of anything, but it'll do the job for video calling and taking snaps of something you need to remember in school. The battery life is decent, with the 8,860mAh battery having just enough juice to get you through a busy school day , or a relaxed one with some homework. Of course, if you go in for long gaming sessions this will change it, but I never had any trouble getting through the day on the tablet with a mix of writing, web browsing a few YouTube videos and a game or a movie to cap off the evening. Acer's 9-hour promise seems about right, and the tablet achieved a respectable 6 hrs 27 minutes in the PCMark battery test. Ultimately, while the world's first ChromeOS tablet is interesting and no doubt a welcome addition to the classroom, I can't say it's particularly convincing for a consumer purchase. The integration of ChromeOS onto a touchscreen in tablet format still feels awkward, and if you're looking for a complete tablet solution at $330, the equivalently priced iPad still outperforms Acer's offering. I'd be more than happy to receive the Acer Chromebook Tab 10 as an educational tool on campus, and for schools, the inclusion of ChromeOS and stylus could make this tablet more attractive than the iPad. Other than that, I can't see it as a good buy for either personal entertainment or work. If you want a Chromebook, then go for one. If you want a good Android tablet, then get one of those. This hybrid can kind of do both but won't excel at being either. If the price were to drop, I could see this as a low-cost computing solution for some, but at $329, it's just not competitive. ChromeOS tablets may yet be the future of Android tablets, I won't call that yet. But this ain't it. If you're just dying for a ChromeOS tab, then this could do for now, especially if you're willing to get a Bluetooth keyboard. Nonetheless, more attractive propositions should arrive on the market in the near future, most notably, Google's own Pixel Slate.